On Friday 15 April UK at 6pm, thousands will assemble at Downing Street to join aMarch With the Homeless, with the march culminating in a mass ‘sleep out’ at Southwark Council Offices from 9pm. The demonstration is being organised byStreets Kitchen, a homelessness justice organisation, and the Kill the Housing Billcampaign coalition, whose housing bill demo was attended by 10,000 people last month. This Friday’s protest aims to highlight rising homelessness as well as provide practical support to those sleeping rough, in an offer of solidarity not charity. Campaigners say the Housing Bill will make many more people homeless. Protesters have been asked to bring tents, sleeping bags, food, clothes and shopping trolleys in preparation to March with the Homeless and offer #SolidarityNotCharity. Campaigners planning the ‘sleep out’ said that there would be music, free food, warmth and community. As well as the central London protests, activities are planned across the capital and across the UK. On 15 April, there are March with the Homelessdemonstrations planned in ten UK towns and cities and Kill the Bill campaignersare gathering outside town halls and housing offices for sleep outs in Camden, Hackney, Hammersmith, Islington, Lambeth, Southwark, Tower Hamlets, Harlow and Leeds. Faith leaders, homeless people’s organisations, community groups and local councillors will be attending the sleep outs. 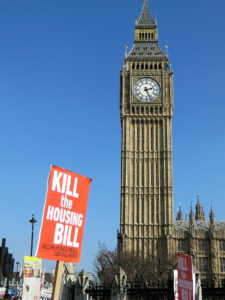 The protest comes as two major elements of the Housing and Planning Bill were defeated in the House of Lords. The Government could be forced to make concessions following these embarrassing defeats, with opposition to the Bill outside of Parliament growing every day. Campaigners vowed to continue to fight every element of the Bill, as it threatens to force more people into insecurity and homelessness. According to a broad definition of homelessness which includes people living in emergency or temporary accommodation, nearly a million men, women and children are set to become homeless by 2020 unless the Government takes action to address a crisis. Street homelessness has doubled in the last five years – with over 7,500 sleeping rough in London in the last year. 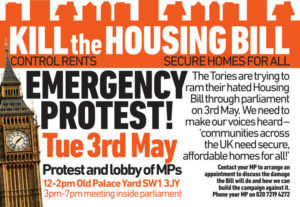 Protests are set to continue throughout this weekend and on Saturday 16 April, Kill the Bill campaigners will join a ‘Housing Bloc’ as part of the People’s Assembly demonstration for Health, Homes, Jobs and Education. 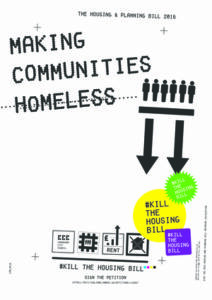 The Kill the Housing Bill campaign is supported is supported by Radical Housing Network, Defend Council Housing, People’s Assembly, GMB Union, National Union of Teachers (NUT), Communication Workers Union (CWU), Bakers Union, Unite Housing Workers, London Gypsy Traveller Unit, Focus E15 Campaign, Generation Rent, National Bargee Travellers Association, UCL Rent Strike Campaign, Goldsmiths Rent Strike Campaign, Leeds Hands Off Our Homes, The Green Party, Momentum, John McDonnell MP and Ken Loach, director of homelessness film Cathy Come Home, and many more. 1. According to homelessness charities and government’s own figures, seeIndependent. The first extends the Starter Home discount to twenty years, not five as the Bill stated. A spokesperson for the Kill the Housing Bill campaign coalition, whose housing bill demo was attended by 10,000 people last month, said: “These defeats show just how unpopular the Tories’ bill is becoming. It’s clear that it will worsen the housing crisis, and force more people into homelessness. It aims to destroy council housing, condemning millions to a lifetime of insecure, expensive private renting. On Friday 15 April UK at 6pm, thousands will assemble at Downing Street to join aMarch With the Homeless, with the march culminating in a mass sleep out at Southwark Council Offices from 9pm. The demonstration is being organised by the Kill the Housing Bill campaign and Streets Kitchen, a homelessness justice organisation. Thanks to everyone who came to the last campaign organising meeting on Saturday 2nd in London. We have set ourselves a packed schedule again for the next 2 months. We have already had a massive impact with our campaign by exposing the government’s agenda with this Bill and forcing a public debate about it. Hundreds of amendments have been submitted by the lords, which is delaying the bill becoming law, and now we want to maximise the pressure on MPs and Lords to throw out this Bill when it comes to a vote. To make our campaign events successful, like the recent national march in London, we have set up a number of working groups. We also have teams working on finance, trade-unions, and estates. Would you like to join one of these teams or can you help with any of these tasks? Please reply by email and we will add you to the email discussion group so you can be actively involved in the campaign co-ordination. then we really need to hear from you. The strength of this campaign will be the breadth of views and issues it can bring together and no professional spokesperson can put forward our case as powerfully as the people directly affected. 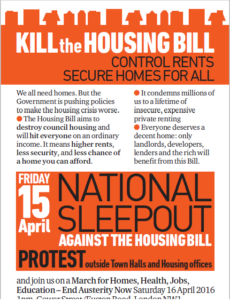 15th of April – Nationwide sleep-out outside Town Hallls against the housing bill – A chance to hold rolling street meetings, tap into local media, and make everyone aware that the Housing Bill could make any of us homeless! 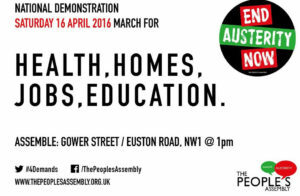 16th of April – Join the Housing Bloc on the People’s Assembly National March for Jobs, Homes, Health and Education. We will be joining junior doctors, teachers, disabled people and all the other groups like ourselves who are at war this callous austerity government. 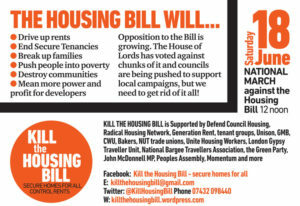 18th June: Second national march against the Housing Bill in London – save the date. The Housing Bill won’t solve the housing crisis – instead, under the provisons of the Bill, homelessness can only increase. 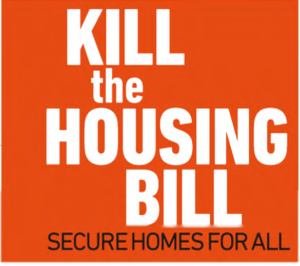 Kill the Housing Bill is supporting the March with the Homeless next Friday 15th April, Downing Street, 6pm. The march will join the Sleep Out at Southwark Town Hall from 9pm (see event below for details). Come prepared to camp: Bring tents, sleeping bags, food, donations, shopping trolleys. The Kill the Housing Bill campaign has called a Sleep Out to highlight rising homelessness. Local housing groups are planning sleep-outs at local town halls to raise the issue of local homelessness. Groups are planning to provide food and blankets, donations will be welcomed and distributed locally. Sleep outs are planned in: Camden, Hackney, Hammersmith, Islington, Lambeth, Southwark, Tower Hamlets, Harlow, Leeds. 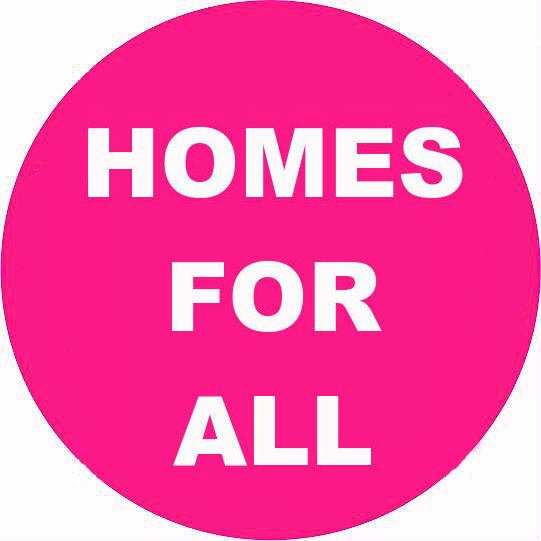 Sisters Uncut and Focus E15 will join thousands from across the country this Sunday to oppose the Government’s Housing Bill and demand: secure homes for all, rent controls, homes for people not for profit. PHOTO OPPORTUNITY: The march will assemble at Lincoln’s Inn Fields at 12 noon Sunday 13 March 2016. Community housing campaigns will lead the march, joined by John McDonnell MP and celebrities, migrants, architects, private renters, students, trade unions and more. Rally in Parliament Sq at 2pm. The demonstration is organised by the campaign to Kill the Housing Bill#KilltheHousingBill. Campaigners say the Bill, currently in the Lords, threatens to make the UK’s housing crisis much worse by sending rent and house prices soaring and aims to destroy council and social housing. This week has seen opposition to the Housing Bill escalate. 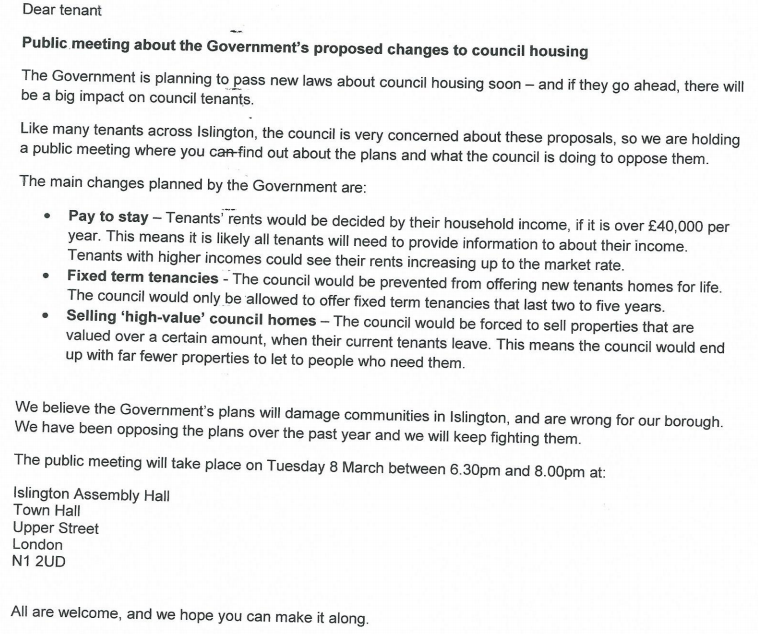 This Tuesday, ameeting at Islington Town Hall to oppose the Bill attracted over 400 people. AndRadical Housing Network, a network of London-based housing campaigns, are protesting the Bill by occupying an empty property – prime real estate – near Harrods to set up ‘Our House’, a pop-up Community Centre with a week-long programme of events. “Focus E15 will be demonstrating against the Housing Bill this Sunday because this Bill is the worst attack on social housing we’ve seen. It will result in the private sale of up to 100% of council houses, and raise rents through “pay to stay”, forcing thousands from their homes and out of London. Sisters Uncut, a feminist group taking direct action over cuts to domestic violence services, said: “Two women a week die at the hands of violent partners or ex-partners. Women experiencing domestic violence must have viable housing options to be able to leave abusive relationships. Social housing, housing benefit and refuges are vital provisions to provide women with escape routes, gain independence and heal from their experiences. “The fight for housing rights is a fight for basic dignity – to live and be free to go to school, to work, to be safe, and be part of a community. Whether we were born here, or came later this is all our fight. To win, which together we can, our communities must be untied, bold, and must reject all racism and anti-immigrant bigotry. ● Forces local authorities to sell ‘high value’ council properties when they become empty – the biggest council housing sell-off in generations. ● Does nothing to address the housing crisis, and instead replaces obligations to build social housing with Cameron’s unaffordable ‘starter homes’ – requiring an income of £70,000 in London. ● The march assembles at Lincoln’s Inn Fields, WC2A 3TL at 12 noon on Sunday 13 March. The route is via Aldwych, south over Waterloo Bridge, Westminster Bridge to Parliament. Rally in Parliament Square at 2pm. ● The march will be joined by John McDonnell MP, Caroline Lucas MP, Natalie Bennett and celebrities. ● The Kill the Housing Bill campaign is supported by Defend Council Housing, Radical Housing Network, Focus E15 campaign, Momentum, People’s Assembly, GMB Union, National Union of Teachers (NUT), Communication Workers Union (CWU), Unite Housing Workers, London Gypsy Traveller Unit, National Bargee Travellers Association, Leeds Hands Off Our Homes, The Green Party, John McDonnell MP and many more. ● Spokespeople from the campaign and people in housing crisis are available to interview.